Having witnessed Earth's terrible future, time-traveling rogue Rip Hunter (Arthur Darvill) assembles a group of handpicked heroes and villains to vanquish the immortal Vandal Savage. The creators of The Flash and Arrow deliver a super hero spin-off series that combines characters from both shows with new heroes from the DC pantheon. Join Arrow's Atom (Brandon Routh) and White Canary (Caity Lotz), The Flash's Prof. Martin Stein (Victor G.. Season Two's 17 turbocharged episodes of the Super Hero team-up series amp up the firepower by enlisting both a league and a legion of new characters to join the legendary Waverider crew. 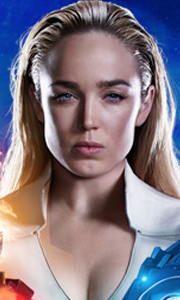 Charged with protecting the timeline from Time Aberrations - changes to history that spawn potential catastrophic consequences - DC's Legends of Tomorrow reassemble with the addition of historian Nate Heywood (aka Citizen Steel) and Justice Society of ..
Own DC Legends Of Tomorrow Season 2 DVD from Deff, DVD, Blu-Ray & 4K Video Specialists - Free UK Delivery..
Own DC Legends Of Tomorrow Seasons 1 to 3 Blu-Ray from Deff, DVD, Blu-Ray & 4K Video Specialists - Free UK Delivery.. When heroes alone are not enough…the world needs legends. Having seen the future,traveling rogue Rip Hunter assembles a disparate group of both heroes and villains to confront the unstoppable threat of the immortal Vandal Savage— a threat which not only puts the planet at stake,but all of time itself. From the creators of The Flash and Arrow comes this super hero team-up that combines characters from both shows — in addition to new hero..
Own DC Legends Of Tomorrow Season 1 to 2 Blu-Ray from Deff, DVD, Blu-Ray & 4K Video Specialists - Free UK Delivery.. In Season One, the dynamic team of rogues and misfits known as DC’s Legends of Tomorrow combat the evil, immortal Vandal Savage. New crew members Nate Heywood/Citizen Steel and Amaya Jiwe/Vixen board the Waverider in Season Two to vanquish the first-ever Legion of Doom. And in Season Three, with new team member Zari Tomaz, the Legends fight to fix the timeline they themselves broke!..